Thanks to Nagehan for bringing this interview clip to my attention. 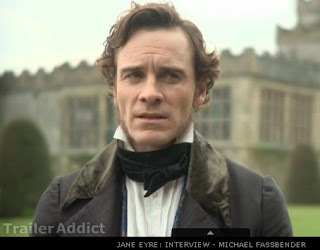 Yet again, it's nice to see Michael talking about the Jane Eyre project and he speaks very highly of Mia Wasikowska, Dame Judy Dench, and the director, Cary Fukunaga. Here are two screencaps, and a link to the interview. Enjoy! Also, I posted a badge link to the MTV/Logo channel Next Must-See Movie voting poll at the top of the sidebar on your right. Click on the link and vote for X-Men: First Class, voting ends March 4th. Jane Eyre will be released in the States on March 11th. 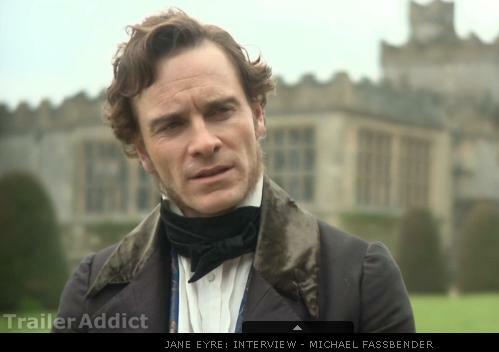 Update: Another interview clip from BBC courtesy of Anglophenia of Michael talking about X-Men.